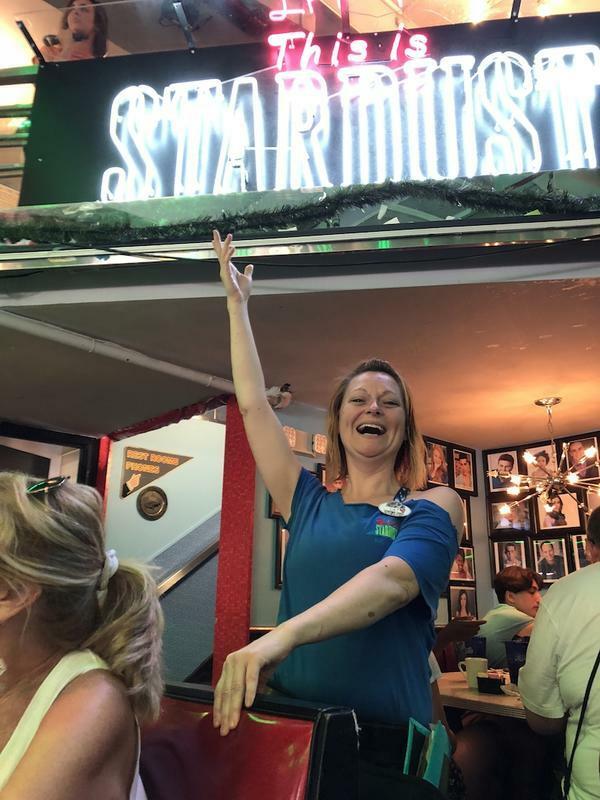 What Makes Ellen's Stardust Diner Special? It special for two specific things, amongst many others. First and foremost, all of the wait staff here are aspiring and/or experienced Broadway, Television and Theater actors and singers. Each waiter or waitress takes a turn, one song at a time, throughout their shift and sings for the diner guests. It is a never ending revolving stage of phenomenal singing and entertainment. 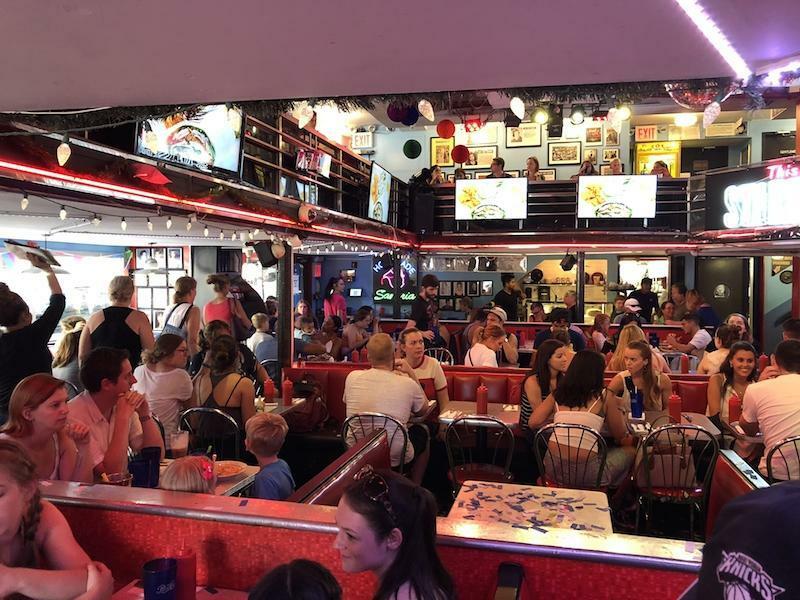 Secondly, the menu at Ellen’s Stardust Diner is a mix of your normal diner fare but with added twists and extras that make the meal here unforgettable. More on that later in the story. The diner features two levels. The main level is always bustling and full. The stage for singing is in the center of the floor and elevated to make the singers visible to all in the dining room. Tables and booths surround the stage and the singers will many times step into the crowd and interact with the guests. The second level surrounds the perimeter of the diner with open and clear sight lines to all of the singing and goings on downstairs. 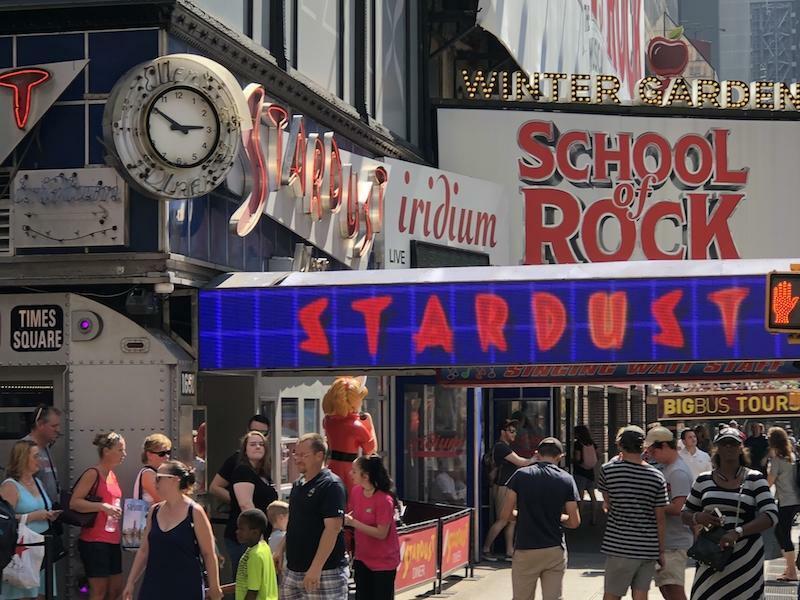 I recently stopped in to speak with two of members of the wait staff here to find out just what makes Ellen’s Stardust Diner special for them and such a desirable place to work overall. Once I heard the stories it all made perfect sense and I now see Ellen’s Stardust Diner as a necessity in the development and retention of upcoming talent and the training grounds for new talent ascending to Broadway. I spoke with Cat Yates who came to NYC from Northern California to pursue her Broadway dreams. She pointed out that the most opportunity for Broadway auditions and being on Broadway itself is being here in the city and available as potential opportunities arise. Even auditions for shows and programs in other cities many times area held here in NYC. She has not only performed as Rosie in Mamma Mia, Miss Hannigan in Annie but also tours in regional performances 4 times a year. 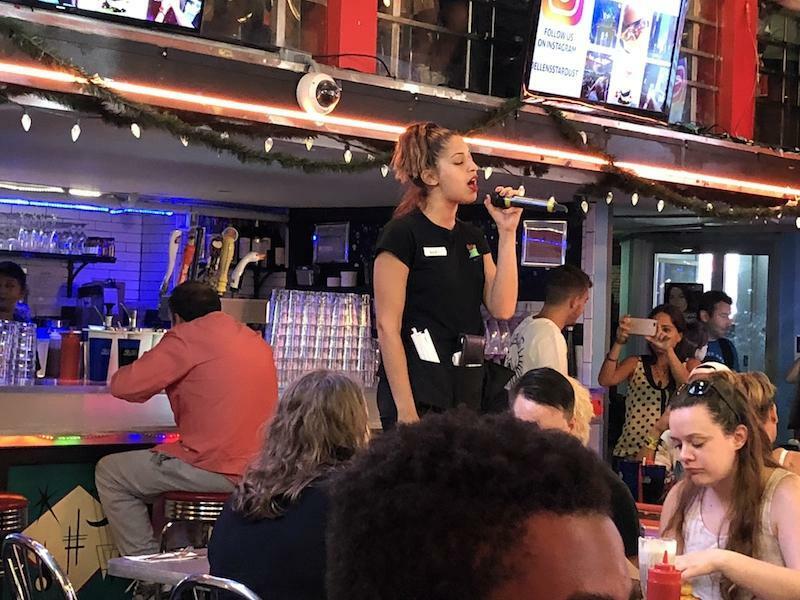 Cat’s gig at Ellen’s Stardust Diner helps keep her voice strong and in shape and sharp in between shows. She loves the people she works with at Ellen’s and considers them family. Her favorite thing about NYC are the abundant choices of food and drink and she attends at least one Broadway show per month to keep herself in the loop of current trends and performances. Josh Cruz arrived in NYC from Orlando, Florida after spending time working at Disney World. 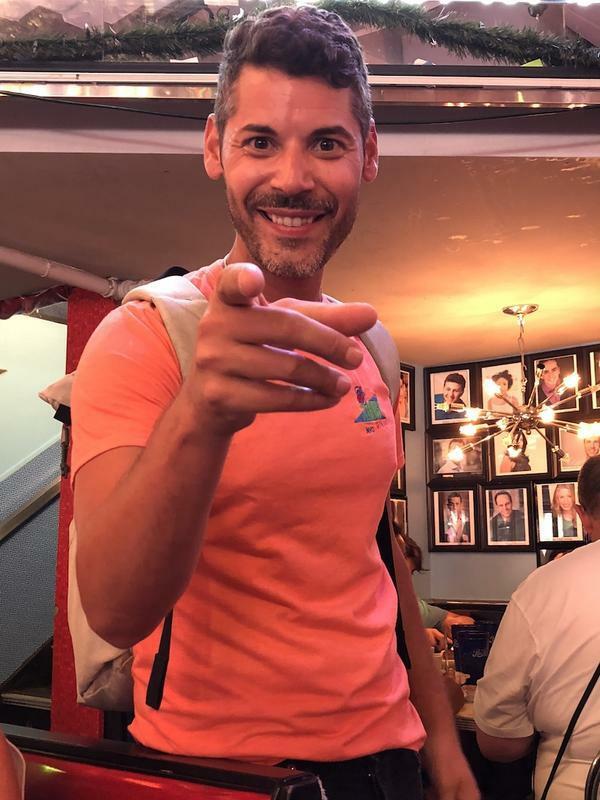 He has appeared as part of the ensemble of Mamma Mia and held parts in Little Shop of Horrors, West Side Story, and Off Broadway performances of Altar Boyz and Wig Out! He spends about half the year in NYC and the oher half singing Cabaret in France. His favorite thing about working and singing at Ellen’s Stardust Diner is the ability to play the stereotype of himself and sing whatever songs purvey that style. He can mix in Latin, Salsa or Spanish music if he’s in the mood. He can also perform newer music and even country if he feels like it. The future focus for Josh is on television and film. He’s willing to consider anything that puts his face on the screen! His response to my question about his favorite things about NYC was perfect. He said that the city feels endless. Endless possibilities, something for everyone and everything stays fresh all of the time, including Broadway. The talent pool at Ellen’s Stardust Diner is deep. There isn’t anywhere else that offers this kind or caliber of continuous entertainment. The diner is fun and decorated to enhance that mood and all guests are eating with smiles on their faces. This is a visit that will create many memories for everyone who walks in the door. The Ellen's Stardust Diner Menu is Fabulous! To compete with such fabulous performances you’re going to need an attention getting menu. Ellen’s Stardust Diner does delver that! Their appetizers range from Vegetarian Lentil Soup to Mac N Cheese Bites with wings, chili and potato pancakes in between. There are salads of all kinds including June Cleaver’s House Salad. Breakfast is served all day too! Omelettes, French Toast and Steak and Eggs are all on the list. Ellen’s Stardust Diner has a long list of sandwiches, burgers, grilled cheese and vegetarian options. Check Out the Menu at Ellen's Stardust Diner Here! The Blue Plate Specials cater to larger appetites and are named after famous Broadway and theater stars like Mamma Mia Meat Loaf, Norman Rockwell’s Turkey Dinner and Gene Kelly’s Beef Stew. After all this you’d think its over but no. Ellen’s Stardust Diner menu features various pasta dishes, side items, a kids menu and a long list of breakfast choices. It would be impossible to not find something to suit you on this menu! If you find a line waiting to get into Ellen’s, don’t be shy. The line moves quickly and you won’t be waiting long. Regardless, it is worthy of the time spent. Ellen’s Stardust Diner is certainly one of the most unique venues in a city full of incredibly unique venues. It put a smile on my face and I’m sure it will yours as well. Click Here to Read About Our Visit to Yankee Stadium Tours!